clay and limestone: Got Shade? You Can Have Pollinators, Too. Got Shade? You Can Have Pollinators, Too. Although, you might be convinced that you can't if you've ever read anything about creating a butterfly or bee garden! Full sun, full sun, full sun is listed as a requirement in every website how to. Full sun meaning more then 6 hours a day. That's a lot of sun when you live in an older home like mine with several dozen canopy trees hiding the sunlight until mid morning. There's enough sun for early blooming ephemerals and spring lovelies, but, once the trees leaf out, the garden becomes a shady paradise. Dry shade is quite a challenge and once the heat and mosquitoes arrive, many Middle South gardeners stop gardening until the fall. Not me! I want to garden year round. My goal is to have a four season tasty garden buffet for the pollinators and other wildlife that visit. Fun to be in and pretty to look at are icing on the garden cake! It's true that butterflies and bees love the warmth and sunshine~but, that doesn't stop any of them from visiting the shadiest parts of my gardens during the growing season. I have plenty of flower offspring to prove that a whole lot of pollination has been going on here! Shade gardeners may not be able to have swathes of sun loving plants...But, gardeners, you can pack an awful lot into a shady bed. Even a small area of sun can be the perfect spot to add a container! For the most part, I like to plant Central Basin natives. They hardly ever let me down. These are the plants that I've seen growing in nearby woodlands and natural areas. 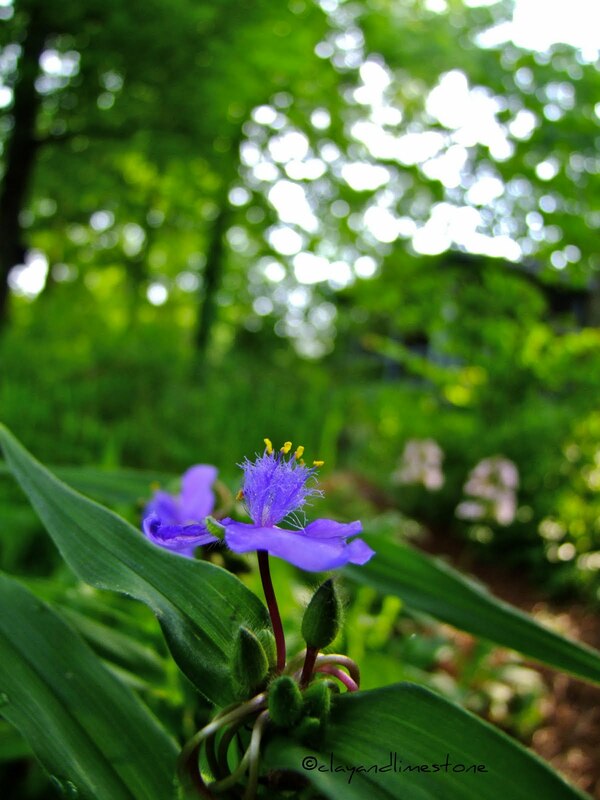 Spring blooming plants like tradescantia, trilliums, columbines, Penstemon X, Spigelia, Golden Ragwort, woodland phlox and the earliest ephemerals. Summer blooming rudbeckia, summer phlox, hypericums, sedges and native grasses keep a shady garden alive with color, movement and critters. Come fall native asters, grasses, False Dragonhead, goldenrods, and cardinal flowers can light up the darkest corners. Here's a few tips for pollinator gardening in the shade. Look for plants that will be grow in semi-shade. Ask your gardening friends what they have grown successfully in shade. Don't be afraid to try a plant in less then ideal conditions....For instance, Phlox paniculata, echinacea and even asters will flower in shade. Plant your sunny garden in containers. Plant a mix of annuals, perennials, natives and non-natives. Repeat in several container. Group them in your sunniest spots. Don't forget that trees and shrubs are host plants for pollinators and produce nectar and pollen. Plant herbs and fruiting shrubs ~Some, like parsley and blueberries, can take the shade. Don't let the shade get you down! PS Remember, if you want pollinators to be happy in your shady or sunny garden~Never, ever, ever, ever use pesticides. 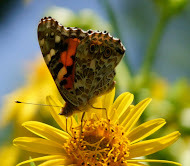 Excellent post, I recently visited a garden that indeed had plenty of Bees and other insects pollinating plants in deep shade! What a beautiful garden. I am drawn to shade gardens. I still have plenty of sun with smaller, immature trees but recently have been creating a "woodland edge" bed. I noticed yesterday that a clump of forget-me-nots were covered with little pollinating flies. It was fascinating to watch them as they flitted in all directions. Great plant suggestions. I'll have to be sure to read all your posts on pollinators. Such a grand service you are performing, dear Gail! My hat's off to you, and those gorgeous photos! The bees need a sun break also. Good choices and your photos, striking. That pot in the sunrays is so pretty. What a great idea. I have a large shady area and have been trying to decide what will work there - it's under a several large oaks and so is pretty dry. I didn't know that rudbeckia would bloom in the shade! You've given me some great ideas. 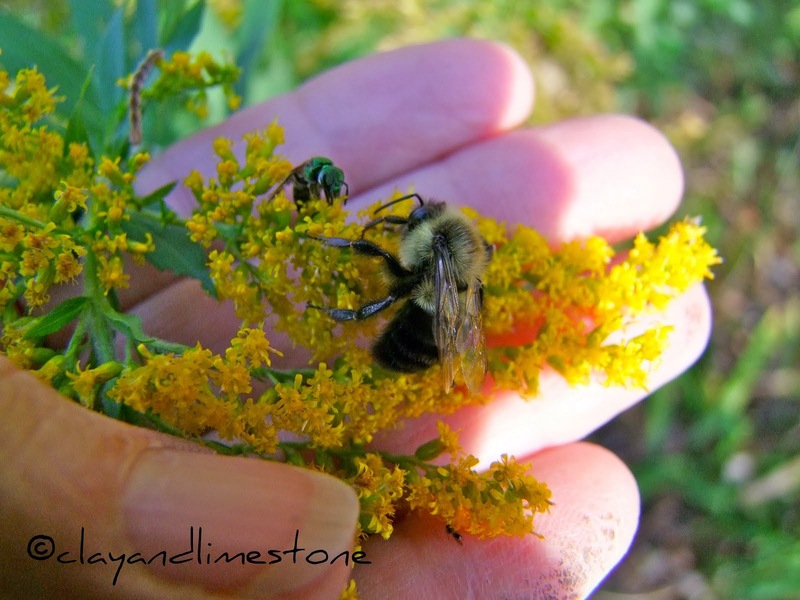 You have so much to offer the pollinators..hard to believe it's mostly shade! Dear Gail, I am blushing. I found a big hunk of Penstemon X in my garden this morning. I didn't know what it was. I planted it in a semi-sunny area. It gets morning sun. It loves its new home even if I didn't remember. I didn't know what it was until it started blooming, today. Most part of my backyard is in shade and yes, I had to learn several lessons until I figured out what plants would do good and bloom in that area of my garden. Gail, I can confirm you are very right saying it is possible to have pollinators even in areas with lots of shade. And your beautiful pictures prove it even more. Very fun~ your right that we don't think of shady areas as a place to plant for pollinators. I notice in my garden that Lamium is a big honey bee attractor in the shade! I have a previously sunny bed. The trees are now large enough to make almost a full shade bed. I'm learning, because I want flowers there, too! Thanks for the post, and the ideas. Our first garden had a lot of shade, and in some areas quite dense. In the brighter areas we did successfully grow hydrangea, pieris, some penstemon, and astilbe though. I wish I'd had a more extensive list like this though back then, it would have saved some trial and error gardening! Gail, There is nothing quite like a shady spot in the heat of summer, don't you think? I love your photos and prose. That macro shot of the Tradescantia gives me a whole new appreciation of the plant. Gail, I'm loving this post about shaded plants.... thank you for sharing.....I'm so glad I stopped by today, I needed some Ideas for the shady area's in my Michigan garden. I have a couple of large shrubs that would cast shadows and block sun from any sun loving plants... I think I may give aster a try. Wonderful post and very informative. P.S.... I agree with you about gardening all year round, I'm thinking about moving to a warmer climate just so I can do just that. I can definitely attest to the truth of this Gail! Our garden is mostly shade, and while I do love typical shade garden plants like ferns and hostas, flowers, and lots of them fill our garden and my heart. Gail you have done a wonderful job providing for the pollinators in your garden. I can't get over how beautiful is the swath of Penstemon ~ such a lovely sight. mawny in great britaiո believed that a German invasion was almost inevitable.